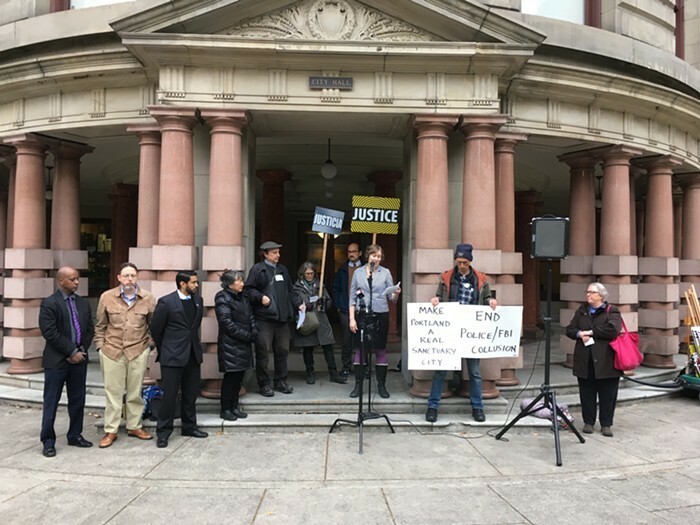 Last week a coalition of police watchdogs, civil liberties groups, and others sprung a new proposition on Mayor Ted Wheeler. Two years after the city voted to re-join the FBI's secretive Joint Terrorism Task Force (JTTF), the groups began a renewed call for Portland to pull the plug. In the age of Trump, their thinking goes, the city should not be devoting resources (in this case two police officers) to the secretive body. Advocates worry about improper surveillance, and of local cops breaking state laws as a result of their involvement. Joining and breaking ties with the JTTF (the city's done both) has typically been a decision voted on by all of the City Council's five members, but the latest calls to disband have particular relevance to Wheeler, who personally oversees the police bureau. So is Wheeler interested in calls to depart from the JTTF? Nope. "The Mayor evaluates our participation in the JTTF on an ongoing basis, and is satisfied with our current involvement," Wheeler spokesperson Michael Cox tells the Mercury. Wheeler's support for the arrangement suggests a majority of city council is happy to be part of the JTTF. In a 3-2 vote in which Portland decided to fully rejoin the task force in 2015, current commissioners Nick Fish and Dan Saltzman cast votes in support.